"The Cottage" is a spacious bungalow sat in the the grounds of our house on the edge of the village. Secluded and peaceful it is the ideal place for a break. It benefits from being close to a shop and pubs serving good food while maintaining a very rural setting. Offering a high standard of accommodation for families and couples alike. The large living room allows space for everyone whatever the weather while the lovely garden offers a real sense of being in the countryside, you might even be lucky and get a visit from one of the local Muntjac Deers! The historic city of Cambridge is only 17mls away and the beautiful Ely cathedral is 15mls. There are many nature and bird reserves locally and easy access to the river for those who enjoy spending time on the water. A picnic bag is available for those planning a day out and the property benefits from free wifi/internet connection. My husband and I have lived in Cambridgeshire for many years and brought up our family here. We moved to our present home in 2006 after falling in love with it. The setting is just lovely and still puts a smile on our faces every time we enter the drive. We hope you will enjoy spending time here as much as we do! We love the fact that it is within a village with a shop and pubs and has easy access to the local town and Cambridge while still having a very rural and peaceful setting. Generous bathroom with bath and separate shower cubicle, sink and WC. Separate WC. 30ft long living room with table and chairs, sofa and sofa bed and sun lounge area with french doors out to the patio and garden. TV with freeview and dvd. Music centre with Ipod connection. Collection of books, games and dvd's. Large kitchen diner with cooker, fridge/freezer, washing machine, dishwasher, tumble dryer and microwave, toaster. 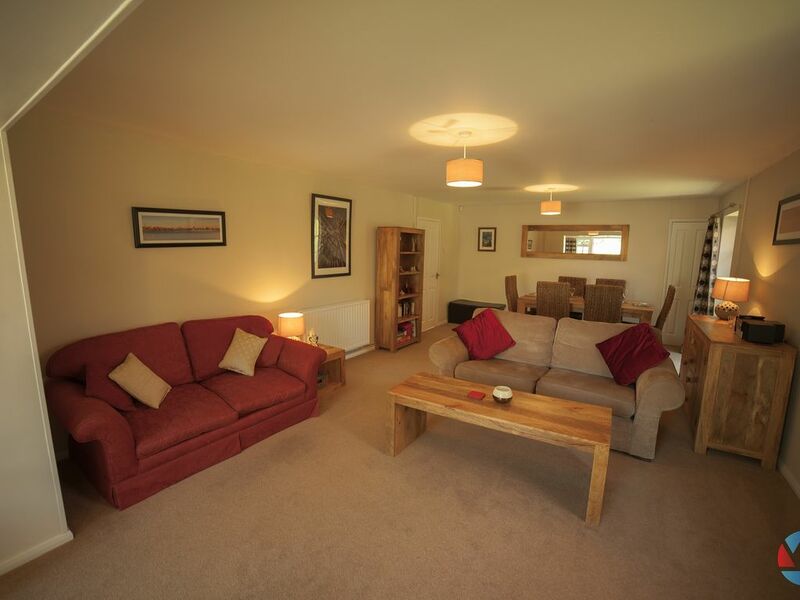 Well equipped for self catering and with views over gardens. There is a picnic set and rug for guests use. St Ives 18 hole golf course is only 2mls from the property and is open to visitors. Notes on accommodation: Beds will be made up on arrival with bedding for sofabed made available if required. The accommodation benefits from central heating. It is a non smoking property. Please note that the garden is not enclosed so young children will need to be supervised at all times when outside. We do not allow pets in the property. Outside: Guests have their own parking area and entrance. There is a large private garden with a variety of trees and flower beds. Outside the french door leading from the sitting room is a patio area with table and chairs and we have provided a BBQ for guests to enjoy alfresco cooking. In the garden is a little summerhouse with table and chairs, where you can while away your days. The garden attracts a large variety of birds and butterflies as well as squirrels and the occasional visit from a muntjac deer. Cleaning / Towels / Linen / Maid service: Towels and linen included and changed weekly. We used the bungalow as a base to visit the region. With its wonderfully spacious layout and beautiful gardens we could easily have spent our days at base camp! The property is very well equipped and what ever we needed, we found. We were lucky to have been blessed with some beautiful weather so even after full days out and about we could relax late afternoon in the garden with a glass or two of wine. The sound of ‘barking’ from local muntjac deer and the call of the occasional cuckoo only helped to make the end of the days even more special. We would most certainly recommend this property to others. So great to hear that you enjoyed your stay at The Cottage. I'm glad you found everything you needed and being able to enjoy a glass of wine in the garden while listening to nature is always a plus! With the combination of lots of space inside and a lovely garden the property has something to offer all year round, whatever the British weather has in store. Thank you for your recommendation, we look forward to welcoming you and your friends here in the future. We had a lovely time in the bungalow despite some horrible weather. Nearly everything you could think of is provided and it's really very large. The garden is great and it was a pity we couldn't get out into it more. Very helpful communication before our visit to arrange travel cot and z bed for our children. There's a huge new Morrisons supermarket a few minutes down the road (with petrol) on the outskirts of St Ives and a Waitrose a bit further. Great to hear that you enjoyed your stay, it's such a shame that you didn't get the chance to enjoy the lovely garden but a least there is plenty of room in the bungalow for the children to play. Look forward to welcoming back here again and fingers crossed for better weather next time! We would recommend this property 100% for its quality and amazing location , its includes all the the things that make it not only a house but a home from home. The minute you walk through the door you know your stay is going to be an enjoyable experience, and the owner was there to answer any questions you may have about both the house or info about the surrounding area . She proved to be so friendly and helpful especially when I needed company when worried about my husband who'd had a major op at Papworth Hospital a 20 mins drive away . Thank you for your lovely review. I am so glad that you found The Cottage so homely and welcoming. It was lovely to meet you and your family and look forward to welcoming back here again in the future. Wishing Charles a very speedy recovery. We stayed here as we were having work done on our house and needed somewhere to stay. The cottage was well equipped and spotlessly clean. Bedrooms were a great size and was perfect for us with a baby. The garden is also lovely, we just wish weather was a bit nicer as it would be perfect for barbecues. Communication with the owners was fab and they were most helpful with anything we needed. I would definitely recommend for a stay. Thank you for your lovely review. We're glad that you found The Cottage so convenient for you and your son, the space, both inside and out, makes it ideal for families. It is a shame you could not take advantage of the lovely garden and bbq, it is a great place to be in the good weather. Lovely to meet you all and I hope you enjoy your new kitchen. This is our second time of staying at "The Cottage" and we are never disappointed with the presentation of the bungalow, it is kept to a very high standard and it is just like coming home each time we come to stay. Lyn makes you feel that you are on holiday but she is near by if you require any help. We are unable to return in 2017 but hope to return in 2018 for another holiday and if the weather is as good as we have had this year then we shall once again enjoy our stay at the Cottage. Thank you, Jean and Robin, for your lovely review. We are so pleased that you find The Cottage so welcoming. It is such a compliment when guests return for more visits and goes to show how much there is in the area for people to enjoy. We look forward to welcoming you here again. Wonderful, clean, well equipped and peaceful. The house and gardens are extremely private. We really enjoyed our stay and used the house as a base to attend our son's wedding. We were able to host guests and have quiet time to ourselves. The peacefulness is one of the things we love about The Cottage, so it is great to hear that you enjoyed that too. I can arrange a photographic course with a local award winning photographer during your stay. Please let me know if you are interested and I can send you some details. Stansted airport 44mls. Luton airport 58mls. Use of car highly recommended. Nearest Town-St. Ives 2.5mls, from here you can pick up the only guided busway in the country which will get you into Cambridge in just 20mins. Cambridge is 17mls away and our nearest train station just 8mlsaway and provides good access into London or to the north of the country. National trust properties in the area include Houghton Mill 5mls, Anglesey Abbey 22mls, Wimpole Hall and farm 24mls. Duxford imperial war museum is a 24ml drive from us. There is a local shop and post office less then 10mins walk away which is open from 7am-10pm and has a cash point. The village has a children's play park and playing fields and we also have a nature reserve only 10mins walk from our doorstep with access down to the river. Within the village are 3 pubs all of which serve food. The market town of St.Ives,only 2.5mls away, is a pretty town situated on the river and enjoys a large choice of restaurants and tearooms along with banks, chemists and a variety of shops. A small supermarket and petrol station is located in the next village, just 2mls away, along with a fish & chip shop. Larger supermarkets can be found in St.Ives. There is a community swimming pool and 10 pin bowling in St.Ives. If you fancy getting out on the river there are marinas both in the village and St.Ives where you can hire boats. Booking Notes: Bookings taken by phone or email. 25% deposit on booking. Balance due 42 days prior to arrival. Bookings made within 42 days to be paid in full. Security deposit is refundable on adherence to terms and conditions and will be returned within 14 days after departure. Changeover Day: Changeover day is Friday. Winter short breaks Friday or Monday. Notes on prices: Additional guests may be accepted, please check with the owners. An additional charge may be applied.